I purchased My First Scissors for my almost 9yo. She has some fine motor skill issues with her hands, which results in a strange scissor grasp and difficulty with cutting. These scissors work like a charm! She is able to hold them with her thumb on top and is able to cut without fatiguing her hand muscles. And wouldn't you know it...my 2yo can cut with these scissors, too! It was worth the extra money in cost to get these scissors. 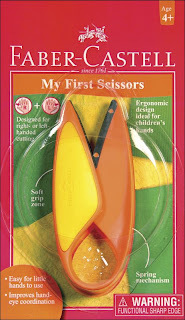 In fact, I am wishing my preschool class at co-op had some of these scissors.